The Chinese gold market is the world’s largest physical gold market. It is also one of the world’s most protected gold markets given that the importation of gold into China is still strictly controlled by the Chinese authorities, and the exportation of gold out of China is generally prohibited. Hence, the market is often referred to as the Chinese ‘domestic’ gold market since gold flows and gold trading in the market are predominantly domestic in nature. Despite these trade restrictions, China still manages to be the largest importer of gold in the world. Furthermore, the Chinese gold mining sector is also the largest producer of gold in the world. Some high-profile precious metals consultancies such as Thomson Reuters GFMS and the World Gold Council still publish annual Chinese gold demand figures that are far lower (for example 900 tonnes per annum) than the annual SGE gold withdrawal figures. These discrepancies are so large that they call for rigorous analysis and explanation. Note that other bodies, such as the China Gold Association (CGA) do state that Chinese gold demand equals SGE gold withdrawals. The idea for a central gold exchange in China was first publicised in 2000 and grew out of China’s gold market liberalisation strategy which involved the transition from a State / PBoC controlled monopoly on the gold market to a free market gold sector involving a ‘gold exchange’ in Shanghai. 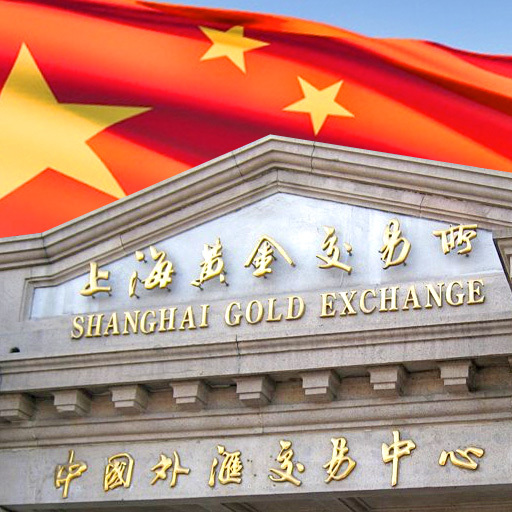 The structure of this Exchange, still under the administration of the PBoC, would allow the Chinese State to monitor gold trading in the Chinese market, while giving China’s population access to the wholesale gold market. The Exchange was launched in October 2002, and by 2004, private citizens in China were allowed to trade in and own gold bullion. Prior to the launch of the SGE in 2002, the Chinese State had for 50 years practised a centralised model of gold allocation in the economy, with the PBoC solely responsible for trading gold in China and supplying the Chinese gold ‘market’ with an adequate allocation of gold each year. It’s instructive to examine in turn each of the components of SGE gold supply. It’s also important at the outset to discuss the concepts of ‘Standard Gold’ and VAT rules as they apply to gold in China, and to appreciate the SGE chain of integrity which prevents gold that has exited the SGE vaulting system from re-entering the SGE vaulting system unless it has been recast into new gold bars by an SGE approved gold refinery. Standard Gold in China is bullion cast by a LBMA or SGE approved refinery in the form of bars or ingots of 50 gram, 100 gram, 1 kilogram, 3 kilogram or 12.5 kilogram form, with a fineness (gold purity) of 9999, 9995, 999 or 995. The SGE defines the 1 kg, 3 kg and 12.5 kg weights as ‘Ingots’, and the 50 gram and 100 gram weights are ‘Bars’. These 5 ingot / bar sizes are also known as Shanghai Good Delivery bars. Since only Standard Gold is tradable on the SGE, only Standard Gold is allowed into SGE certified vaults. Non-bank gold enterprises can also gain PBoC approval to import (and export) gold doré, ore and jewellery into / out of the domestic market. With gold output in 2016 reaching an estimated 455 tonnes of gold, gold mining production in the People’s Republic of China (PRC) is the second largest source of gold supply for the Chinese domestic gold market after gold imports. The third distinct source of gold supply to the Chinese domestic gold market is ‘Recycled gold’. The fraction of Chinese gold supply that is not imported into the Chinese domestic market and that is not domestically mined can be categorized as recycled gold. GFMS’ recycled gold data focuses only on scrap gold. This includes old gold jewellery sold by consumers and industrial product scrap. Conversely, the CGA data for recycled gold consists of three elements, namely, scrap gold, disinvestment, and a category of recycled gold known as recycled distortion. Some of these categories have a net effect on the gold price and some do not. The final category can be labelled as Recycled Distortion, an example of which is “Process Scrap”. Process scrap refers to residual metal left over after fabrication or manufacturing of gold jewellery or industrial products. This could, for example, be from metal spilled during jewellery fabrication. The fabricator sells this scrap to a gold refinery which then reforms the gold into Standard Gold and the gold makes its way back to the SGE. Process scrap gold overstates supply to the SGE and also subsequent demand on the SGE because it has no net effect on the gold price. So both supply and demand would need to be adjusted downwards in this case. Recycled distortion that flows through the SGE overstates both the supply and demand sides. When the volume of recycled distortion is subtracted from SGE withdrawals, the result is ‘True Chinese gold demand’. 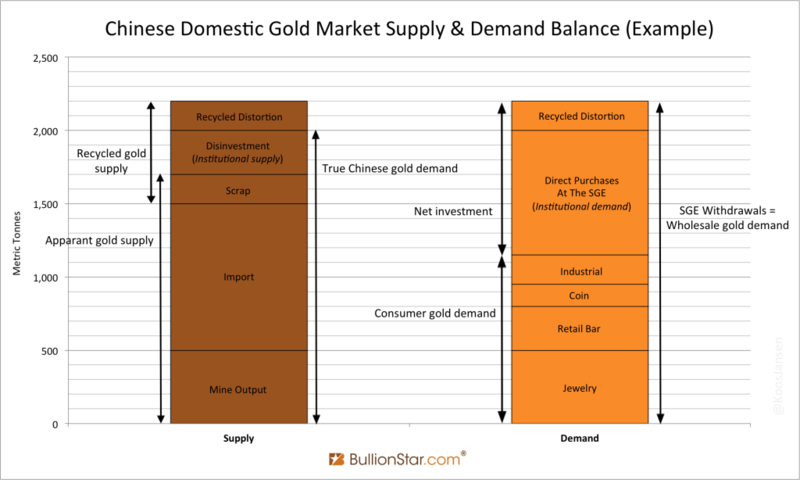 Having looked at the supply side of the equation in the domestic Chinese gold market, it’s important to examine the demand side. 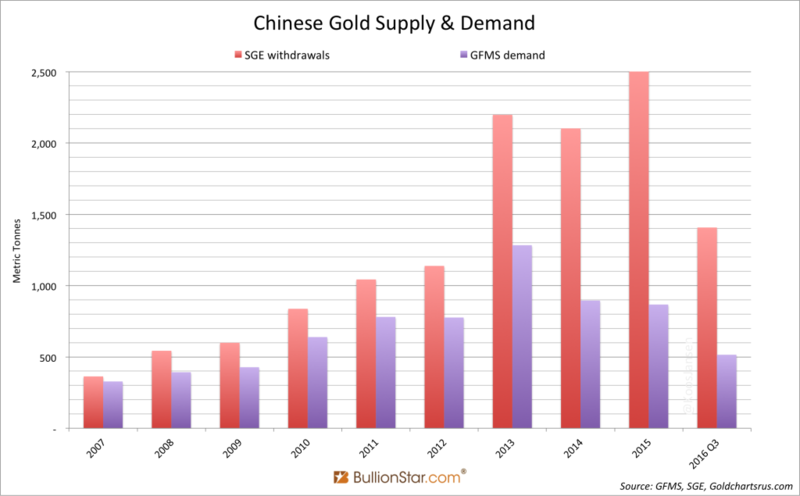 Since most gold supply in China flows through the SGE, logically, most gold demand has to be met by SGE gold withdrawals. From the above bar chart, it can be seen that the main reason why annual gold demand as defined by, for example, consultancy Thomson Reuters GFMS is far lower than the size of SGE withdrawals each year is because GFMS only estimates consumer gold demand and ignores institutional demand.